MAIN MENU. The Digisight main menu includes brightness control of the reticle, choice of the reticle shapes as well as setting of running time. WINDAGE/ELEVATION KNOB. Reticle adjustment (movement of the reticle horizontally and vertically during sighting) is performed by a special knob. Switching from the horizontal movement mode to the vertical and vice versa is performed by pressing a button located right on the knob. WEAVER 7/8” Rail fixed on the left side of the body is used for attaching additional accessories. Mini-USB. The mini-USB slot allows the riflescope to be connected to a personal computer or a laptop to upload additional (including «user-constructed») aiming reticles. QUICK IMAGE ADJUSTMENT. A group of functions including Contrast mode (for a sharp contrast increase), Color mode (successive change of LCD display‘s illumination color) and Sum Light mode (activates sensitivity enhancement algorithm) are available. VIDEO IN / VIDEO OUT. The Digisight N550 is equipped with a socket for connection of external video recording sources or video playback sources. Switching from VIDEO IN mode to VIDEO OUT is performed by pressing a button located next to the socket. EXTERNAL CONTROL. 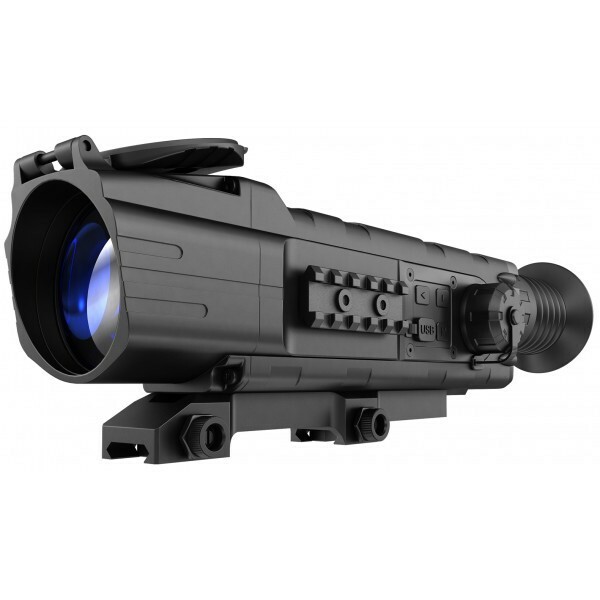 The Digisight N550 can be operated with the help of a remote control which duplicates activation functions of the riflescope, IR illuminator and reticle inversion (see point 11). The riflescope can be powered both with 4 ?? 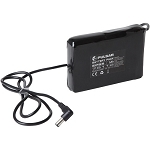 batteries, as well as with external power sources. INTERNAL FOCUSING. The optical system employs an internal focusing mechanism (from 5 m to infinity) with «definite» click-stop focus positions. The focusing provides clear images at extremely short distances as well as optimizes quality at all distances within the riflescope's working range. BRIGHTNESS ADJUSTMENT WHEEL Adjusts optimum brightness of screen’s glow for each specific case. BUILT-IN IR ILLUMINATOR is reasonable for usage at insufficient levels of natural illumination for improvement of observation quality. RETICLE INVERSION. The inversion button allows changing color of the aiming reticle from black to white. The choice of reticle color is subject to the target’s brightness. SCREEN. The choice of one of the four operating modes: blank screen, «Aiming reticle» mode, «Clock» mode, «Aiming reticle & Clock» mode. LENS CAP. The riflescope’s lens is covered with a plastic cap. The lens cap is fixed on the scope’s body for better loss prevention. POWERING UP the unit and the built-in IR illuminator is carried out successively by gradual turning of the selector switch. I was having big problems with unwanted night visitors to my backyard. I first mounted a flashlight to my pellet rifle, but the animals would see it and run long before I could get a shot off. I bought the Pulsar N550. I also have a night vision security camera system set up. When the alarm would sound I would grab my Umarex Octane pellet rifle with the Pulsar N550 mounted on it. None of the dangerous animals that I was having no luck getting rid of had no idea they were being locked in on and I could put them down before they even knew what hit them. I put down a 50 pound coyote with one shot in his left eye, I couldn't believe it when it happened. I expected to see him just run off like all the other times, but he dropped instantly. My property abutts an area where there are lots of coyotes and I am constantly concerned about protection for my grandchildren and pets. I now have one less coyote to worry about. The N550 is absolutely awesome and at a great price. I recommend it to anyone looking to do any kind of night shooting. Any nights that there are no varmints to worry about I have a small shooting range set up with pop up targets so I can keep sharp when I need it most. I have now gone 2 straight weeks on no night time visitors at all. With all the things that cause stress in a person't life the N550 have given me one less thing to worry about. Buy it you won't regret it! !